Come to Ward Custom Metal of Gainesville, TX, for complete pre-cut, prefabricated build kits from small backyard storage sheds to large metal barns up to 125 feet wide. We utilize only the finest 26 gauge sheet metal for all our metal build kits. In addition to our prefabricated metal build kits, we also love a good challenge, so get in touch with us about customizing your new metal building and to get a FREE quote. We’re so confident in the integrity and durability of our metal build kits that all exterior sheet metal paint is completely covered by a 40-year warranty. 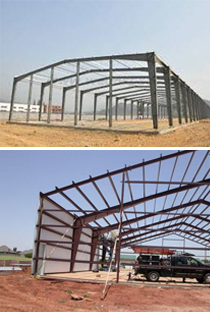 Contact us to get a metal building that is constructed to last for years to come. You’ll always get exceptional quality at a great price!